I usually do not spend my time aboard ship lying on a deck chair by the pool. 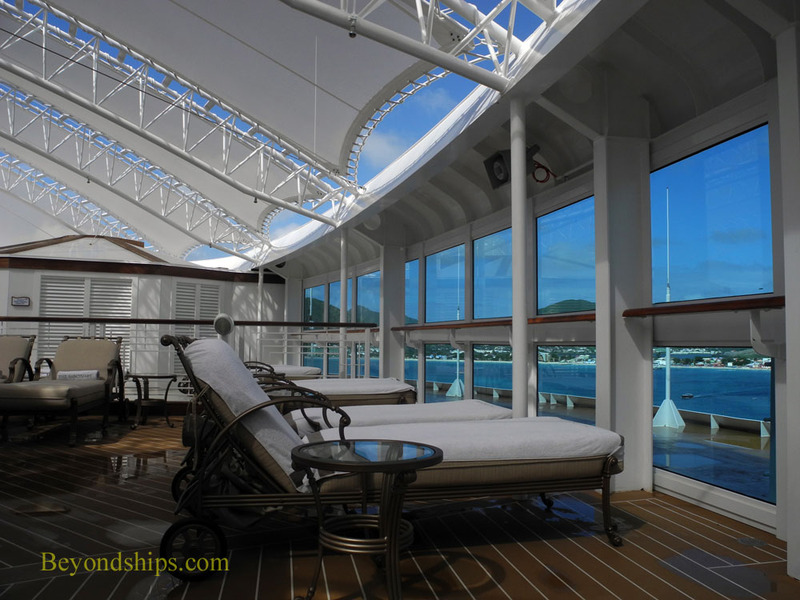 There is nothing wrong with that form of relaxation but I am the kind of person who finds more relaxation in activity, Thus, I was somewhat skeptical of whether I would enjoy the Sanctuary on Royal Princess. Princess Cruises first implemented the Sanctuary concept on the Crown Princess in 2006. It is a premium, adults-only area dedicated to relaxation and pampering. The area has premium furniture including thick-padded large loungers and the guests are served by a dedicated team of “Serenity Stewards” dressed in shorts and green Hawaiian shirts. 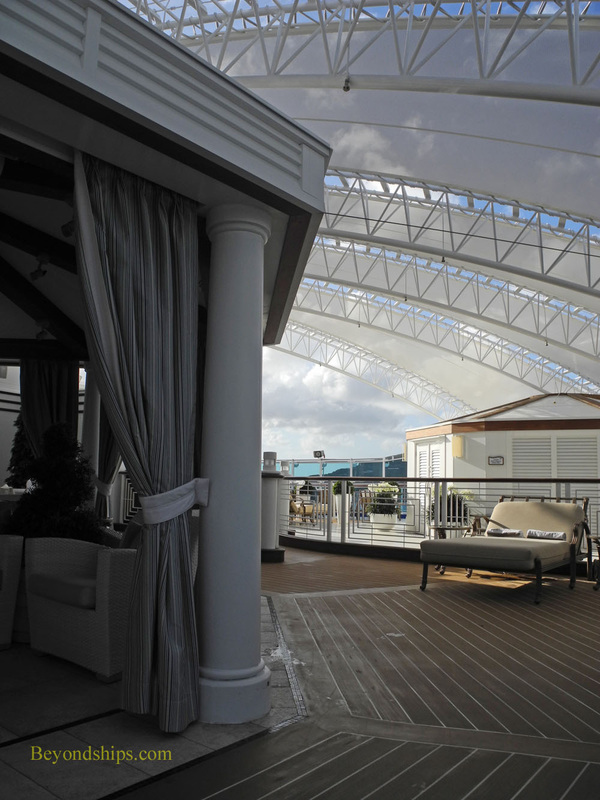 The Sanctuary was such a success on Crown Princess that it has been made a standard feature throughout the Princess fleet. 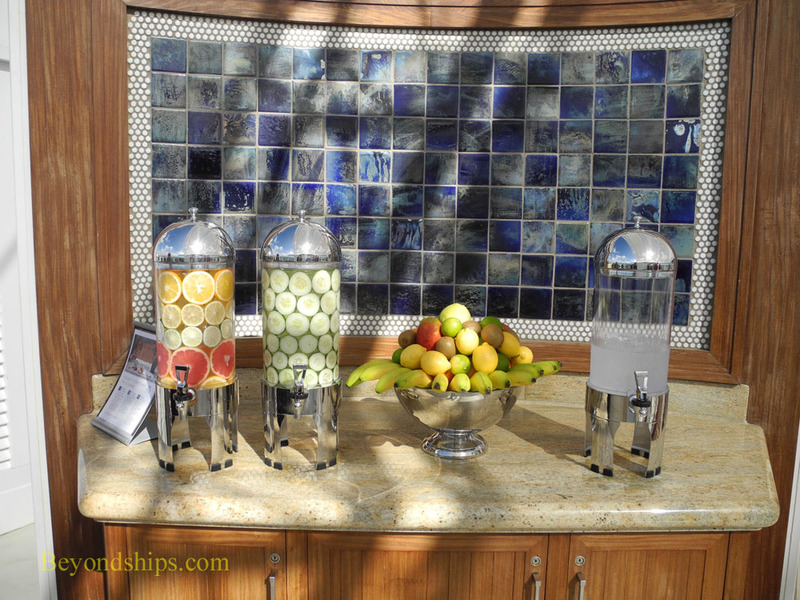 A number of other cruise lines have also implemented their own versions of the concept. The Sanctuary on Royal Princess is more than 20 percent larger the Sanctuaries on previous Princess ships. Overall, it has much the same tranquil atmosphere and premium furniture. 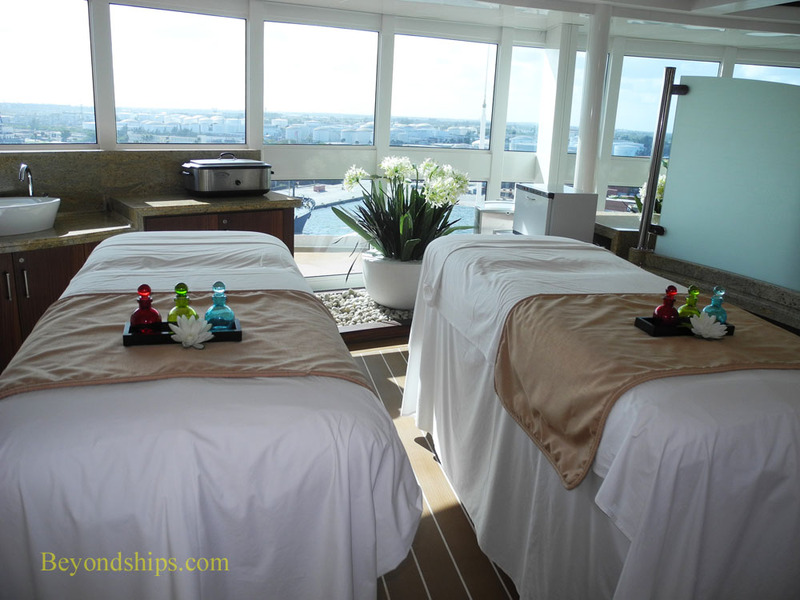 As on Crown Princess, there is a tent where you can have a massage or a facial. However, there also have been some additions including rock gardens and topiary planters. 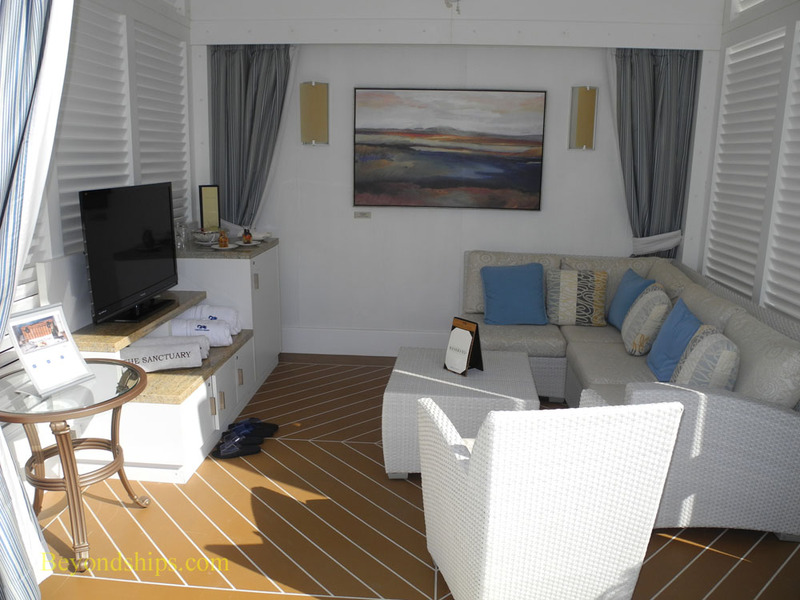 More prominently, two new cabanas, complete with flat screen televisions and living room style furniture, have been introduced into the Sanctuary. My ambitions did not run to a cabana. I just wanted to experience the Sanctuary from one of the premium loungers that populate most of the Sanctuary area. You can purchase a pass that reserves a specific lounger for you for either a half day or a full day. Some of the loungers are in the open while the others are under an opaque white shelter that reminded me of the material used to make sails. I elected a lounger under the shelter. One of the serenity stewards showed me to my lounger. He and his colleagues seemed to always be smiling. They were eager to please and did not appear to mind answering questions that they had probably had to answer hundreds of times before. After the serenity steward had brought me one of the Sanctuary's exotic citrus-flavored ice waters, I stretched out on the soft cushions. It was a beautiful sunny day and as I looked over Royal Princess' bow, I could see St. Maarten's cruise port complex and off to the left, the town of Phillipsburg. People were coming and going from our ship and from the other cruise ships berthed nearby. Since it was a port day, it was not surprising that the Sanctuary was not full of guests. Although the steward had told me that all of the other loungers in my vicinity had been reserved, only one was occupied. Later, a few more people arrived. However, the loungers are far enough apart that you still feel as if you have your own space even with people about. But intruding into that space was noise coming from the neighboring ship and from a dredge working in the harbor. Looking at the menu that was on the little table next to my lounger, I saw that guests could request an MP3 player with Bose noise-canceling headphones from the stewards. These allowed me to enter into my own private world. Gone was the noise of the dredge and the other sounds of the port. I could drift between sleep and conscious thought. It resulted in a feeling of deep relaxation. Of course, such work makes one becomes hungry. The menu listed a number of light items that one of the serenity stewards would get for you in exchange for a delivery fee of three dollars. Of course, I could have gotten up and walked to the Trident Grill or to the buffet. 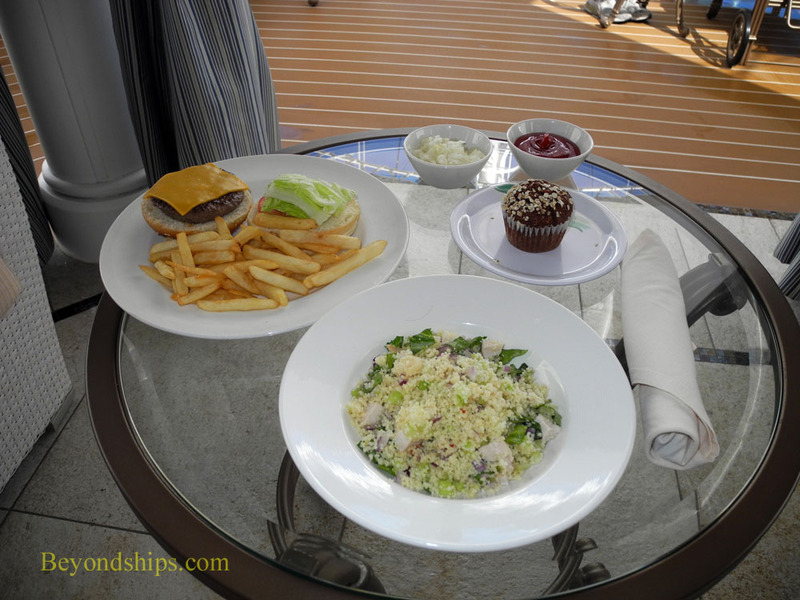 But this small amount did not seem to much to pay to preserve my mood and in less time than I expected the serenity steward was back with the salad, muffin and hamburger I had ordered. Later, as the sun was starting to fade, I was surprised to find another serenity steward standing by my lounger asking if I would like tea. 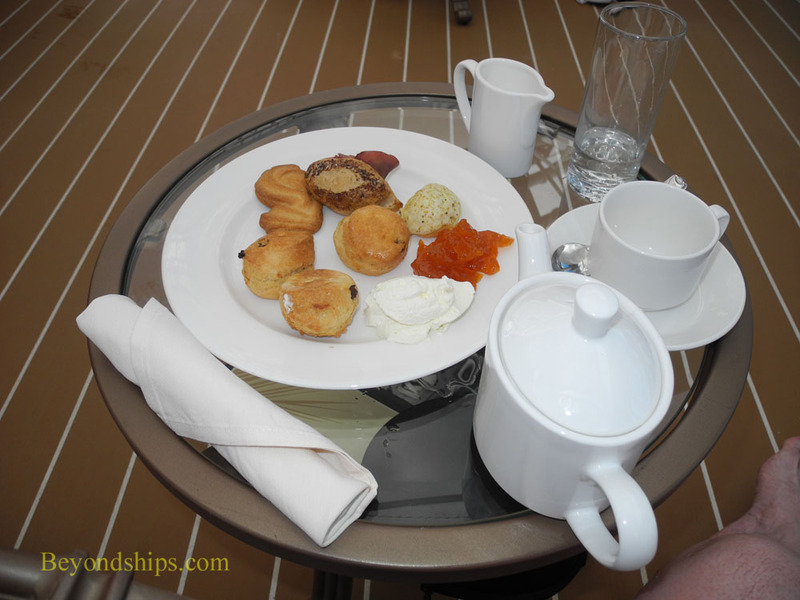 This turned out to be a full English tea including sandwiches, cake and scones with preserves and cream. It was dispensed onto my table from a cart, which the stewards were wheeling from guest to guest. This tasty repast was entirely complimentary. As darkness fell and Royal Princess made ready to leave port, I decided it was time to abandon my lounger. It had been a very relaxing and rejuvenating day, which is what the Sanctuary is designed to provide. 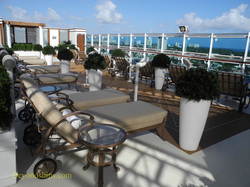 Above: Premium loungers in the sheltered section of the Sanctuary. Above: Guests can have massages and other spa treatments in the Sanctuary. Above: Citrus-flavored, cucumber-flavored and plain ice water. Above: Lunch in the Sanctuary.